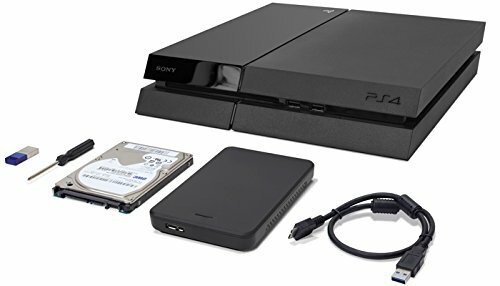 OWC 2.0TB Internal Storage Drive Upgrade Bundle for Sony® PlayStation® 4. Includes: 2.0TB 2.5" Seagate/Samsung 5400RPM HDD, OWC Express USB 3.0 Black Enclosure, 8.0GB Dual USB Flash Drive, and screwdriver. Quadruple the storage capacity of your PS4 with this 2.0TB hard drive. Includes everything you need for data transfer, installation, and re-use the existing PS4 drive. Verified compatible with the Sony PlayStation 4 Slim and PlayStation 4 Pro. Play, store, and do more with this 2.0TB drive upgrade for PlayStation 4 that's a whopping 4x larger than the stock drive and faster so you can boot, save, and level load faster than the stock drive. Perfect for loading more games without having to remove any data, plus getting a performance boost too. This is a user serviceable part according to Sony that will not void your PlayStation 4's warranty. Includes everything you need to: Upgrade/replace the existing 2.5" drive in your PlayStation 4, Transfer all of your game data to your new drive, Convert the PlayStation 4's original drive to a new external for use with any USB 2.0 or 3.0 equipped computer.